It plays like a dream. Like a dream you have after finally passing out after experimenting to destruction with scrumpy and Red Bull. It would be a lie to say I came into this whole thing sceptical of whether or not this remake would be up to snuff, because I never fail to be impressed at just how great at coding some people really are, but I can honestly say I did not expect this game to be this good. It is so fast, and so smooth. I played it on an emulated Atari 800XL until my fingers made noises like huge insects doing mating dances and it didn't lag or stutter once. 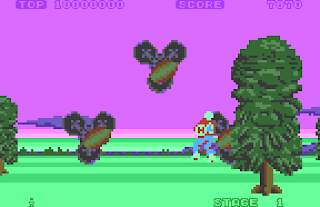 Just like in any of the other ports of the game the air between you and your enemies is easily filled with energy balls with rapid hammering of the fire button, and our gravity defying blond hero still swooshes about the screen at an admirable speed. 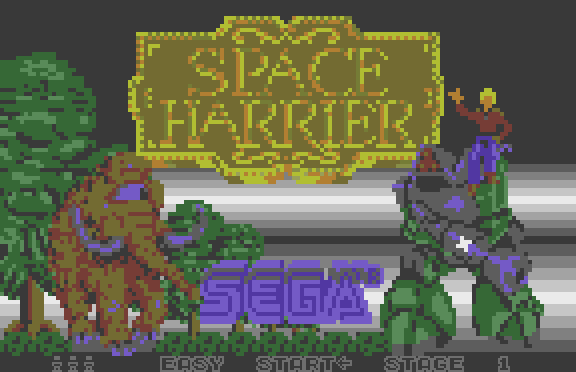 Coder/graphics artist Chris Hutt and musician Sal Esquivel have done a bang-up job of bringing in the familiar sights and sounds of the original Space Harrier as well. Enemies, scenery and bosses are all identifiable as being from the original, and a digitised voice welcomes you to the Fantasy Zone just like in the arcades. The theme tune we know and love rattles along raucously as our hero flies, runs, and stumbles over bushes on his quest to blow the crap out of stuff. 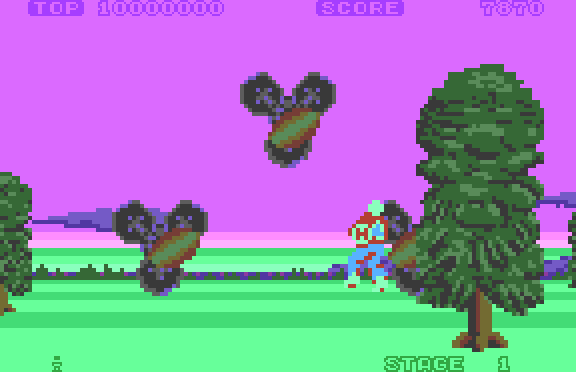 This port’s graphics were never going to be as stunning as those of the original, but this 8-Bit bantam gives it a damn good go with its limited palette and there are very few moments where the relative quality of the graphics drops below "good". 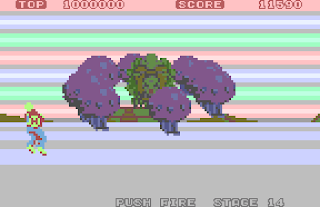 Playing an 8-Bit port of a 16-Bit arcade game and looking for discrepancies in the graphics is pretty much up there with watching an episode of Thunderbirds just to pick out the strings. It’s a hard slog finding something bad to write about this game, and I honestly don’t have it in me. Space Harrier for the Atari XE/XL series sits proudly alongside its brothers on other formats, and it is quite fitting that the game that impressed people back in the 1980s when it appeared riding on a powerful arcade cabinet system is turning heads in the 21st Century by making an appearance on a relatively weak little microcomputer. The format may have changed, but the stone pillars on Geeza are still there. And I still keep running face first into them, just when I think I’m doing really well. If this thing took 20p pieces I’d be broke. Download the game here (from the project homepage). Run it using Altirra (freeware). Space Harrier can also be purchased on cartridge here (from Atari-Sales.com) for $44.95 USD.